(MissionNewswire) Salesian missionaries in Santiago, Chile inaugurated a new home for youth called, Nueva Luz (New Light). 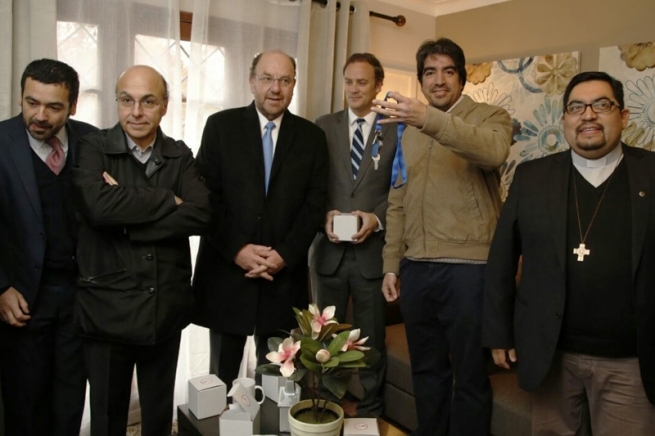 The home can accommodate eight people and was created thanks to a public-private collaboration between the Don Bosco Foundation of Chile, the construction company Sodimac and the Chilean government. This is good news for the community after a fire destroyed the Salesian Miguel Magone home in February. After the inauguration, the first five inhabitants entered the house. The inhabitants consisted of three girls and two boys who until recently had been sleeping on the streets in Santiago. Salesian schools, social development services and workforce development programs throughout Chile are helping to break the cycle of poverty for homeless youth through programs and shelters like this one while giving many hope for a more positive and productive future. According to the World Bank, Chile has a fairly low poverty rate at 14.4 percent. Chile’s problem though lies in the country’s high rates of income inequality and inequality within the educational system. Salesian missionaries working in the country focus their efforts on providing education and social services to poor, at-risk youth. At Salesian schools, universities and youth centers throughout the country, youth can access an education as well as the skills and resources they need to become successful adults. As a result of the vocational and technical education provided by Salesian programs, Chilean youth are more likely to find stable employment and improve their standard of living.